Christmas shopping is in full swing, radio stations are blaring Jingle Bells, and the end of the year is roaring at us like that toy train at the bottom of the mall Christmas tree. With the end of this year and the beginning of a new one, it is important to take time to evaluate and plan. Tis the season is the best time to sit down, sip some gingerbread latte, and look forward into 2015. There is a wonderful gap in time right after Christmas and before New Years Day when the worldâ€™s spinning seems to slow down for a moment. If we are not careful we will find ourselves repeating the same year again, and again, and again. If we allow ourselves to be swept away by the current of the day we get pulled into an undertow of allowing everyone and everything to dictate our lives. Year after year, after year. . . we will look back on our lives and realize we have gone no where. The way to avoid this is to set aside time to evaluate the previous year and determine a plan for the upcoming year. 1. Â Goals allow us to direct our lives instead of being directed by circumstances and otherâ€™s priorities. The statement â€œthe squeaky wheel gets the oilâ€ is a very true statement. But if you are constantly putting oil on immediate squeaky wheels you will never have time to determine what is making them squeak and stopping it. Let the wheel squeak for a while and take time to step back and think. Carving out time can be extremely difficult. But understand this time of evaluating and goal setting to be an investment in the overall health of your life and those that you lead. 2. Â Goals help you to identify what are the most important areas in your life and establish plans to guard those priorities. Sit down and choose five major areas of your life. They may be things like family, marriage, ministry, church, friends, education, relationship with God, etc. For example, if you know that you need to spend more time with your spouse, then take this time to figure out what is keeping that from happening. 3. Â Â Goals help you to move forward as a person. When was the last time that you did something that really stretched you? Goals help us to move from a wish to making something a reality. What is it in your life that is keeping from trying something really big? This may be the year when you need to cut off personalities that are constantly having a negative impact on your life. Set a goal and go for it! 4. Â Calendaring With Vision and Goals in Mind. Now as you look into the new year take your goals and put them on the calendar. For example, if you know you need to take batter care of yourself then put times at the gym on the calendar. It is up to you to guard those goals and times on the calendar. If you and your spouse have set aside Saturdays to be family days â€“ donâ€™t allow something of less importance to crowd out that set aside time. It is important to also build in “margin” or extra space into your calendar so that when life happens and you have to enter into that time you had set aside for something else, then you can still have time to accomplish what was originally in that time slot. 5. Â Â Communicate Your Goals with Those Around You. Letting other people know what you are working on will communicate to them what is important to you. It can also serve as a point of accountability when you begin to get off track with your goals. Vision â€“ what does the end of the road look like? What vision do you have for your life, or far more importantly, what is the vision that God has of you life? Write it down. No one knows the whole life big picture, but you should have some idea for the next year. 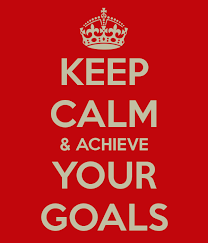 Goals â€“ Now after you have seen a picture for the next year, then establish some goals based upon the vision. Goals are not wishes. Wishes have no plan; goals are a vision that you have developed a plan to accomplish. Mile Markers -Â Goals are then broken down into reachable steps or â€œmile markers.â€ If your goal is to run a half-marathon, then study and research to see how you would train and spread that out over the needed length of time. Regular evaluation â€“ how are we doing? Are we moving forward? Take time to regularly (daily, weekly) epaulet to see if you are on track to reach your goal and accomplish your vision. No organization is autonomous from the community at large â€“ how is the progress you are making affecting those around you? Sometimes your goals and forward movement can have a positive (or negative) affects on those around you. Recognize that others may not like your growth because it may challenge them — others may see it as a source for inspiration. Either way, keep moving forward.